LIBERTY, NY (July 19, 2015) – The Liberty Fire Department is celebrating 145 years of volunteer service to the community. 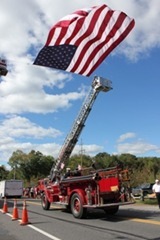 To help celebrate this anniversary, they will be hosting a variety of events during a week long celebration that will culminate with the 87th Annual Sullivan County Volunteer Firefighter’s Association Parade. July 29 at 6:00 p.m. the festivities will begin with a carnival on the ball field at the Liberty Elementary School, directly behind the Police Station. The carnival will open each evening at 6:00 p.m. and at 3:00 p.m. on Saturday, August 1. At 7:00 p.m. on the evening of Friday, July 31,there will be a “Mardi Gras” style parade followed by Bed Races down Main Street. The action then shifts to the Carnival Midway for awards, trophies and DJ entertainment. 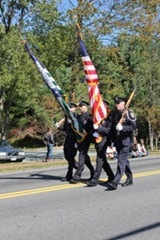 The 87th Annual SCVFA Parade will kick off on Saturday, August 1 at 2:00 p.m. Immediately following the parade there will be a “People’s Choice” battle of the bands competition. So, if there was one band that you really enjoyed as they marched by, make sure you get to the stage on the Carnival Midway to cheer them on. Raffles, souvenirs, food, drinks, entertainment and the carnival rides will be available as you await the presentation of trophies at 7:00 p.m. The BBQ Fundraiser Raffle will also be drawn at this time. (Winner need not be present to win; to purchase raffle tickets ask any LFD member or stop at the Beer Warehouse 190 Mill Street in Liberty) DJ entertainment will continue thereafter with a fireworks show at approximately 10:00 p.m.